the American Legion Honor Guard will go. to honor all of those who defended this land. will bring comfort and closure to what they have achieved. receive the tribute they deserve. shouts the Sergeant-At-Arms of the Honor Guard conducting Military Honors. Three times, a volley of shots ring through the graveyard. MILITARY HONORS one last time. the graveside ritual has become increasingly common as veterans die. presented 114 Military Honors burials. RAY A. 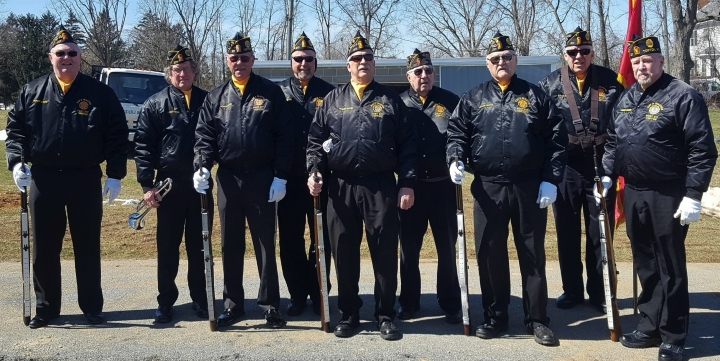 MASTER POST 217 American Legion Honor Guard. is a reverent and solemn service to bid farewell to our departed comrade. that offered his/her life for the country. the presenting of the American Flag, under which the veteran served their country. REQUEST THIS SERVICE FOR THE VETERAN. and/or the Post 217 Honor Guard to render the "Final Salute". Let us not forget what these veterans did to preserve our freedom. WHO GAVE THEIR ALL FOR OUR FREEDOM. Let us give them the "Military Honors" burial they deserve. American Legion, Ray A. Master Post 217, Inc.